The foremost rule of conjuring is that the secret of a trick should never be revealed. It is therefore with some trepidation that Gordon Bruce and Bob Read’s engaging and entertaining accounts of the hunt for the mysterious Arthur Watson are followed by an exposé – a biography of their prey. However, perhaps this is one occasion when exposure of a magical mystery may be forgiven: in order to acknowledge a man whose contribution to the history of conjuring was overlooked for so long. Arthur Watson was born in Lincoln in 1863, the youngest of five children born to Thomas Watson, an engineer, and his wife Ann. His childhood home was in Sincil Bank in the parish of St Peter at Gowts in Lincoln and he was educated at Lincoln Grammar School. Watson’s original intention appears to have been to follow in his father’s business: in the 1881 Census of the United Kingdom, Watson’s occupation is listed as ‘machine apprentice’. However, a change of heart or of circumstances led him to alter his career ambitions and the following year he enrolled as an undergraduate student at Owens College in Manchester (now Manchester University), undertaking a Bachelor of Arts degree in English and Music. As was the practice at the time, he sat the University of London examinations for the final part of his degree and was awarded his BA from the University of London in 1885. By early 1890′s he was living in Hampstead, London. In the UK census of 1891 he listed his occupation as ‘musician’ (as he had when he registered readers’ card at the British Library the previous year). The early part of his career is unclear, but in 1910 he was working as a member of the academic staff at the University of London, where he later became secretary to the Academic Registrar. Between 1898 and 1910 he published a number of articles in historical and antiquarian journals. Articles on the Sciopodes (1898) and the Tarasque (1901) concerned mythical creatures. These articles included depictions of these beasts in stone carvings in European cathedrals and their associations in mediaeval Christian lore. This early interest in mediaeval church carvings would prove to be his main academic focus later in life. Other articles, such as ‘Music Galleries’ (1900) and ‘Knives with Music Inscribed’ (1910) reflect his interests in music and history. Articles including ‘The Rebus‘ (1898), ‘Tumblers’ (1903), ‘The Funambulist’ (1904), ‘Jugglers’ (1907) and the two-part article ‘Conjurers’ (1909) have no clear association with his other interest – though they themselves share a common theme, being concerned with puzzles, entertainment and magic. All of these articles are scholarly works, demonstrating a remarkable depth of research and breadth of knowledge in each area. It remains uncertain whether Watson had an interest in conjuring. 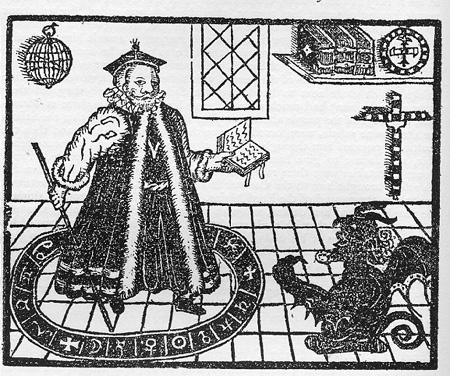 There is no record of him having been a member of The Magic Circle or any other magical association. However, there are a few subtle hints in his article ‘Conjurers’ that suggest he may have had more than a passing interest in the art. In the opening paragraph of ‘Conjurers’, he states “Never were more wonderful feats accomplished than are performed at the present time”, indicating a familiarity with the performances of conjurers. Further evidence of his experience of contemporary magicians comes later in the same article, when he states “The conjurer of the present day usually attempts to interest his spectators, not merely by the tricks he performs…but also by his accompanying remarks”, adding the opinion that “conjuring may be effective without speech”. He also uses the word “patter” (still in use today) to describe the words used by magicians during their performance. Evidence of Watson having a more significant interest in magic – or perhaps another example of the meticulousness of his research? Arthur was not the only academic in the Watson family. His brother, Foster Watson, was Professor of Education at the University of Wales, Aberystwyth from 1895-1913. Foster Watson was a highly-respected educationist, whose interests also included philosophy and literature. He had a particular interest in the life and work of Joannes Ludovicus Vives, the 16th-Century Spanish humanist and educational theorist, whose work is quoted several times in his younger brother Arthur’s article ‘Conjurers’. Evidence, perhaps, that the brothers cooperated in this endeavour. Following the publication of his article ‘Knives with Music Inscribed’ in 1910, there was an hiatus of eighteen years before his next publication, when he would have been 65 years old. Later in life, he developed an academic expertise in mediaeval Christian iconography, and in particular, depictions of the Tree of Jesse (illustrating the descent of the Messiah from Jesse of Bethlehem, based on a passage from the biblical book of Isaiah). It seems likely that this was an interest that he was able to cultivate during his long retirement. He completed a substantial amount of research in this area, which led to him being awarded a PhD in 1935 at the age of 72. The records of the University of London show that his Doctorate was awarded to him as an external candidate and not as an honorary degree – a significant achievement. Watson’s doctoral thesis ‘The Early Iconography of the Tree of Jesse’ was later published, and is still cited in present-day texts. Arthur Watson died of pneumonia on the 15th January 1954 at the age of 91. As far as can be established, he never married and did not have any children. He was predeceased by his brother Foster (died 1929), who had married late in life and also died childless. Watson’s estate at the time of his death was valued at £7,100. The principal beneficiaries of his Will were his housekeeper and his sister-in-law – Foster’s widow. He also made bequests to the Department of Manuscripts at the British Museum, the National Institute for the Blind, societies for the humane treatment of animals, and to several friends and former colleagues at the University of London. As Bob Read discovered, his collection of academic papers and photographs were bequeathed to the Warburg Institute with which he had a longstanding association. Arthur Watson was cremated at Golders Green crematorium in London and, in accordance with his Will, his ashes were scattered. There is therefore no gravestone or memorial in his name: he remains characteristically elusive to the last. 1. United Kingdom censuses: 1851 1861, 1871, 1881, 1891. 2. University of London General Register Part 3, page 711. 3. Encyclopaedia Britannica Dictionary of Arts, Sciences, Literature and General Information. 11th Ed, Vol X: Evangelical Church to Francis Joseph, Encyclopaedia Britannica Company, New York, 1910. 5. University of London, Senate House Library. Index to theses, ref 0-11297. 6. C. R. Chapple, ‘Watson, Foster (1860-1929)’, rev. M. C. Curthoys, Oxford Dictionary of National Biography, Oxford University Press, 2004. 9. Calendars of the Grants of Probate and Letters of Administration (England and Wales). 10. Bob Read. Searching for Arthur Watson in Textualities 1 – Magic Afoot: Rosslyn Lore and More, (Ed: Jennie Renton); Edinburgh (2006). ISBN 0955289602. 1898 Glimpses of the Anglo Saxon Boy. The Educational Review, June 1898. 1898 Sciopodes. The Reliquary & Illustrated Archaeologist, October 1898; Vol 4: pp. 269-270. 1898 The Rebus. Antiquary, December 1898; Vol 34: pp. 368-373. 1900 Music Galleries. Musical News, December 22nd 1900; Vol 19, No 512: p 541. 1901 The Tarasque. The Antiquary, August 1901; Vol 37, No 140: pp. 234-239. 1903 Tumblers. The Reliquary & Illustrated Archaeologist, July 1903; Vol 9: pp. 186-202. 1904 The Funambulist. The Reliquary & Illustrated Archaeologist, October 1904; Vol 10: pp. 217-231. 1907 Jugglers. The Reliquary & Illustrated Archaeologist, January 1907; Vol 13: pp. 1-16. 1909 Conjurers: Part 1. The Reliquary & Illustrated Archaeologist, April 1909; Vol 15: pp. 81-100. 1909	Conjurers: Part 2. The Reliquary and Illustrated Archaeologist, July 1909; Vol 15: pp. 176-191. 1910 Knives with music inscribed. T. Lea Southgate & Arthur Watson; Musical News 1910. 1928 The Speculum Virginum with special reference to the Tree of Jesse. Speculum (3) 1928 pp 445-69. 1934 Early Iconography of the Tree of Jesse. London: Oxford University Press, 1934. 1938 Mary in the burning bush. Journal of the Warburg Institute, Vol 2, No 1, July 1938: pp 69-70. 1947 Saligia. Journal of the Warburg and Courtauld Institutes, 1947; vol 10: pp 148-150. 1947 Manuscript of Virginum Speculum in the Walters Art Gallery. Journal of the Walters Art Gallery, vol 10 1947: pp 61-74. 1957 The Imagery of the Tree of Jesus on the West front of Orvieto Cathedral. In: Gordon, D.J. (Ed): Fritz Saxl, 1890-1948: a volume of memorial essays from his friends in England. pp 136-146.